Having a green and attractive lawn regardless of the weather is not such a hard task to achieve if you have the right lawn sprinkler. Of course, there are various factors to consider for the perfect sprinkler. And we have made it easier for you by providing the necessary information you need to get the best product to make your lawn the envy of everyone. Everyone is now living life in the fast lane. There is hardly any time left to do anything let alone water the flowers and the lawn. And because we want out homes to look the best and hospitable, we need the best lawn sprinkler. It can also be quite tiring and boring taking the time to water the lawn ourselves. Let’s admit it; you cannot religiously follow a program to water the plants. You will find you have overwatered while trying to make up for your forgetfulness – maybe procrastination. As a result, our lawn suffers as it waits for you to find the time and pick the hose. A good lawn sprinkler will, therefore, do all the tedious work for you. You will not need to be around for the lawn to look glorious. And another thing, the sprinklers will prove convenient as they provide the right amount of water the grass needs to thrive and look attractive. And unlike the hoses, sprinklers may make use of smart water saving features significantly reducing the total monthly bill. If you have children, they will love playing in the water during the hot months. There is nothing as refreshing as letting the water drops fall on you when it is simmering hot outside – and children know better. The spray sprinkler: these models are perfect if yours is a small garden or space. They work considerably well if you have a vegetable garden on the side. Spray sprinklers are not spendthrifts when it comes to water and will be suited for those worrying about the water bill at the end of the month. The Drip Systems: these are commonly used in greenhouses. They have a small hole where water drips into the soil. 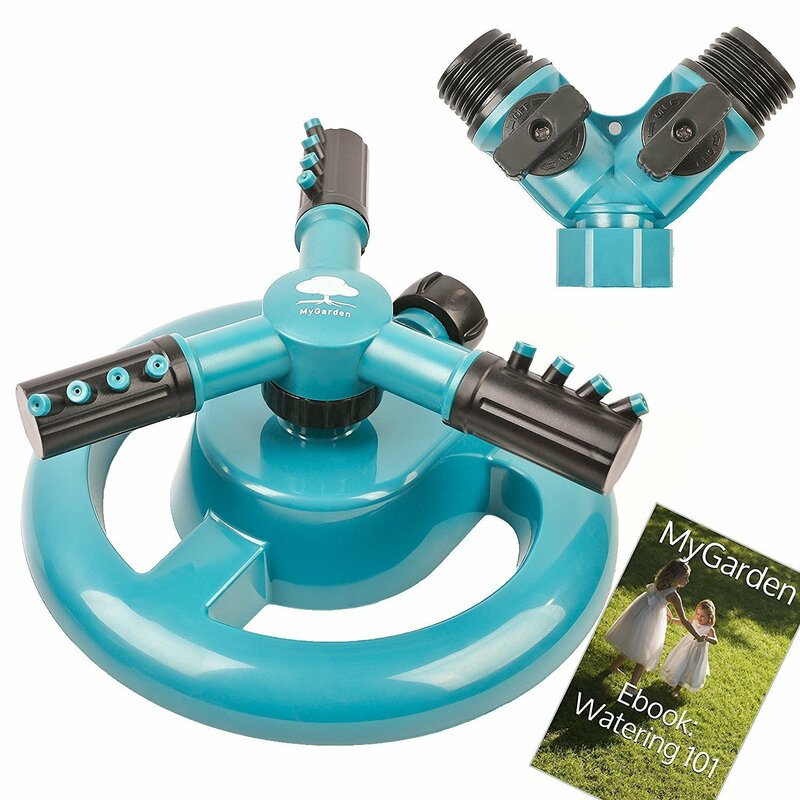 These systems are ideal for watering specific plants and leaving other areas – it allows you to focus on feeding certain plants. Drip systems allow controlled use of water. Rotor Heads: these are large scale sprinklers that will comfortably accommodate extensive areas. 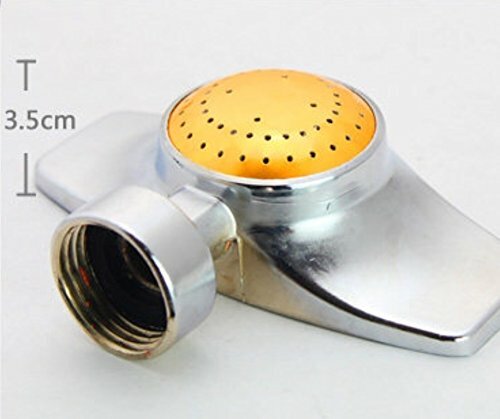 They are designed to produce a continuous stream – quite different from spray sprinklers. Rotor heads are not quite the water savers that you may be thinking about. Oscillating Sprinklers: these sprinklers make use of individual jets to deliver water to the plants. The good thing about oscillating sprinklers is that they provide an even distribution of water to the plot or land – you can adjust according to the size. These sprinklers are commonly plastic and aluminum. But you will still find brass varieties that demonstrate more efficiency in water dispersion. Standing Sprinklers: these sprinklers are typically mounted on a tripod and have the benefit of reaching a large area of the lawn. If using a tripod, you have the option of adjusting according to the coverage. But sprinklers can prove more useful in certain circumstances – you can have various sprinkler heads in multiple areas of the lawn. Travelling Sprinklers: these sprinklers use water pressure to self-propel. They move along the path laid down by the hose. You can vary this path accordingly depending on the plants and areas you need to water. It is essential to teach the children how to behave around sprinklers to avoid injuries. Regardless, avoid the pulsating models if you have a toddler around. Sprinklers function by spraying water in the air. In the majority of the time, this water falls on the leaves. If the sun is shining bright and the weather is simmering hot, some of this water gets lost in the atmosphere through evaporation. If the sprinklers are poorly controlled, then chances of your plants contracting diseases are high. When the water sits on the leaves for an extended period, they can get blights that can decimate your entire crop population within a short time. Before you can deploy your sprinklers, you may need to first determine the amount of water your greens are going to need. It is better to water deeply and infrequently than often and shallowly. Watering deeply allows the roots to go deeper and avoid instances of drying out quickly during the hot summers. Set your sprinklers to water at dawn. This time is the best as there is an adequate sun to dry the leaves and cool enough for minimal evaporation into the atmosphere. This sprinkler has a durable and heavy-duty construction ensuring that it will stay for long. The product has attractive coverage that goes as far as 2800 SQF. And when the pressure of the water is low, the device works well – you will not need to worry about anything. The product is safe for small children as it does not contain raised objects. There are also no moving objects except the large spray area. Not the best of quality and may have several flaws that would affect its effectiveness. If you are in the market for a durable piece of equipment, then you are in good stead with this sprinkler. The body is die-cast metal that will give you a significant number of years. It has a wide sprinkling area of up to 5,800 square feet – a decent distance. The sprinkler has an adjustable collar you can use to determine the coverage. You can go with either full or partial coverage. You will need a sprinkler with a wide coverage area if yours is an expansive lawn. This garden lawn has a decent 3600 square feet. It has an attractive design that the kids will love playing with. The sprinkler also comes with a number of spray patterns that you can choose according to your needs. There is a 90-degree rotation pattern that can go as far as 6 meters. The other with an angle of 45 degrees can reach a radius of 10 meters. This a brass impact sprinkler that produces a classic sprinkling sound. 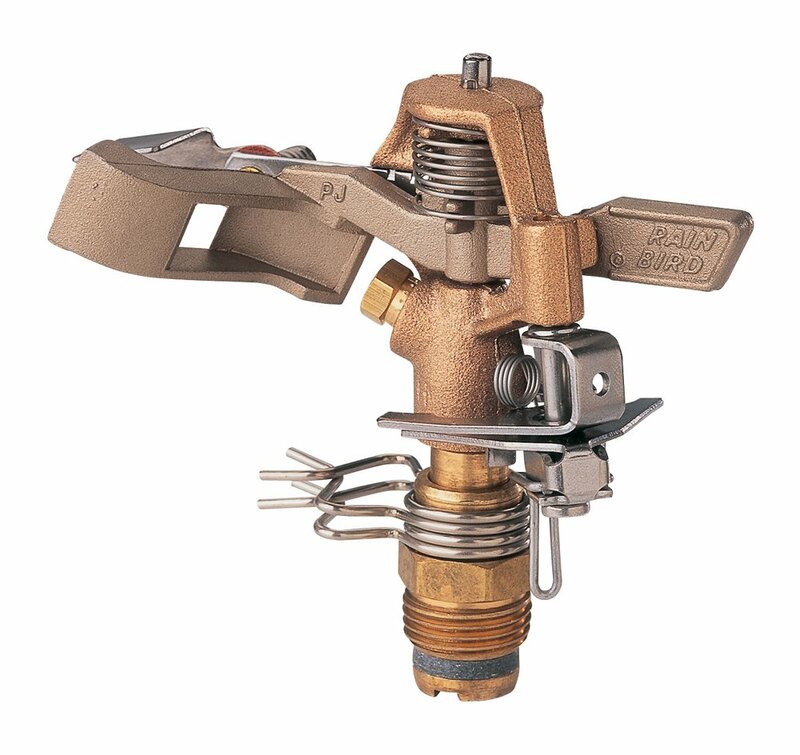 It is a durable sprinkler made of stainless steel, brass, and bronze. This product is easy to install and will not give you much trouble. And it comes with a number of spray patterns which you can choose from. This sprinkler is not so hard to operate like some sprinklers in the market. The sprinkler is among the few with a full circle sprinkling ability. This means that it is appropriate for your garden. The distance is also adjustable and can vary it according to preferences. If your lawn is medium-sized, then this sprinkler may be the best for you. 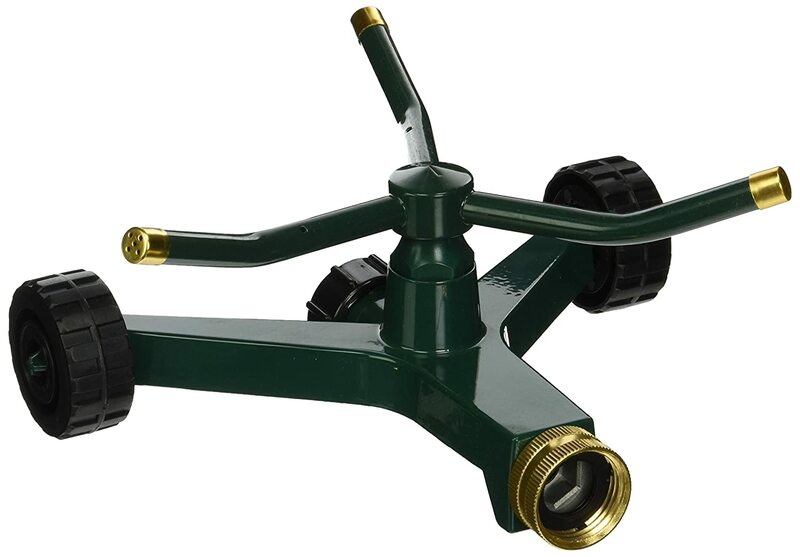 This lawn sprinkler is well-made and so is durable to give you many service years. Lawn sprinklers are some of the essential gardening equipment that makes your task of watering the grass and other plants so much easier. The best sprinkler should be easy to use. It should be durable and have sufficient coverage area. 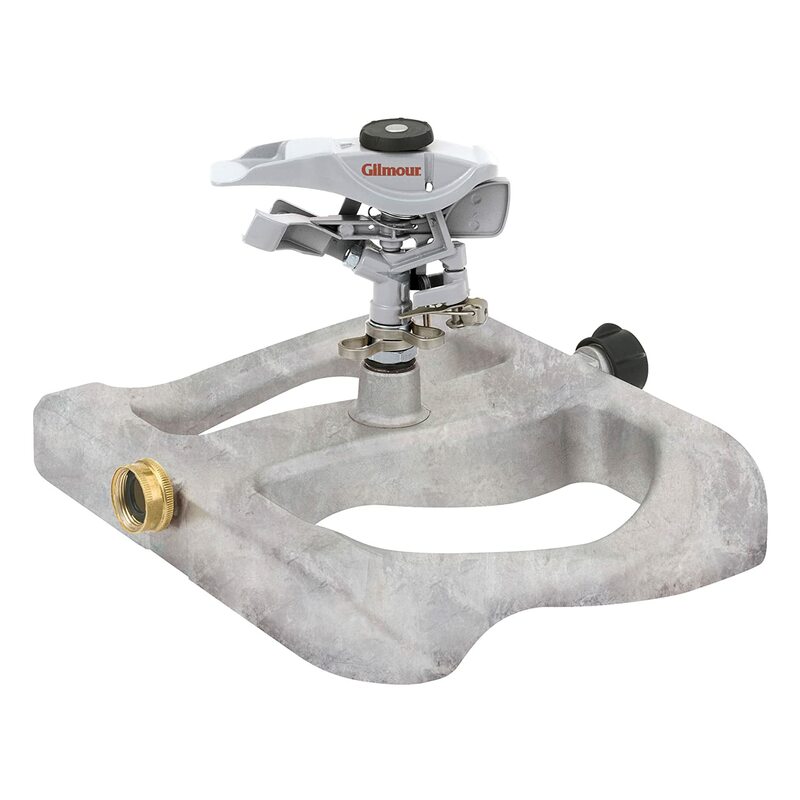 From the above review, our top choice product has to be Gilmour Heavy-Duty Adjustable Circular Sprinkler.